Earlier I posted an account of how the San Francisco Board of Supervisors voted unanimously on Tuesday in favor of the city’s bid to host America’s Cup 34. Then came time for the Mayor to sign. 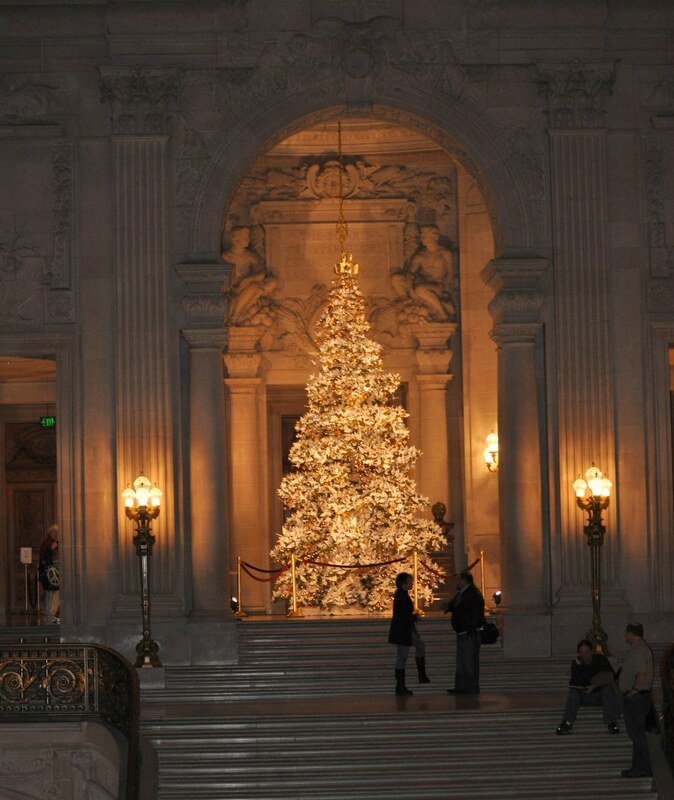 City Hall was looking bright and seasonal . . . There is an answer. He can. 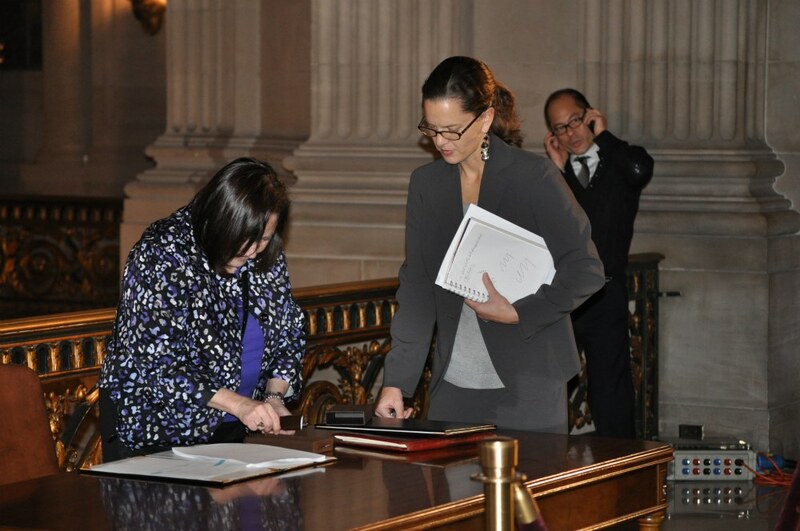 Kyri McClellan, AC project manager for Mayor Gavin Newsom, is seen here at right, with Martha Cohen, also of the Mayor’s office, preparing the Host City Agreement for the Mayor’s signature . . .
Below: Monique Moyer, Director of the Port of San Francisco, in yellow, with, left to right, Supervisors Bevan Dufty, Eric Mar and John Avalos, In the foreground, Supervisor Michela Alioto-Pier. Did I mention it was a very upbeat moment? 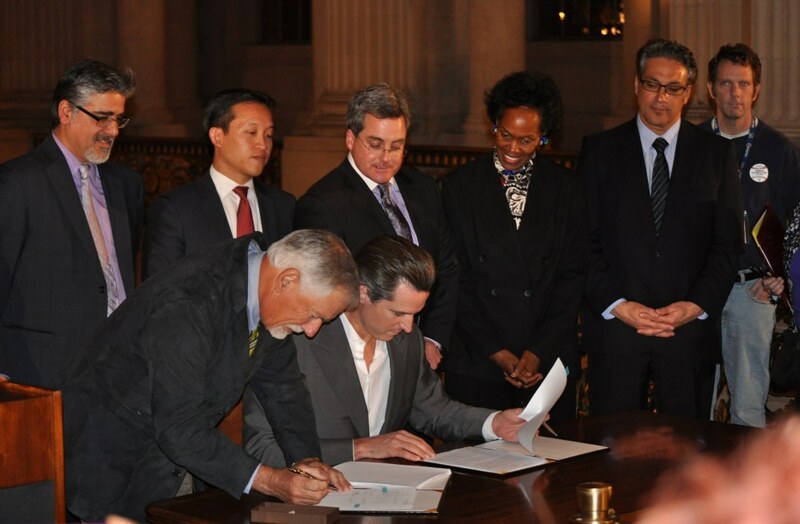 In the photo below, the chairman of the America’s Cup Organizing Committee, the fundraising arm of the event, Mark Buell, leans in alongside Mayor Newsom to sign the Host City Agreement. 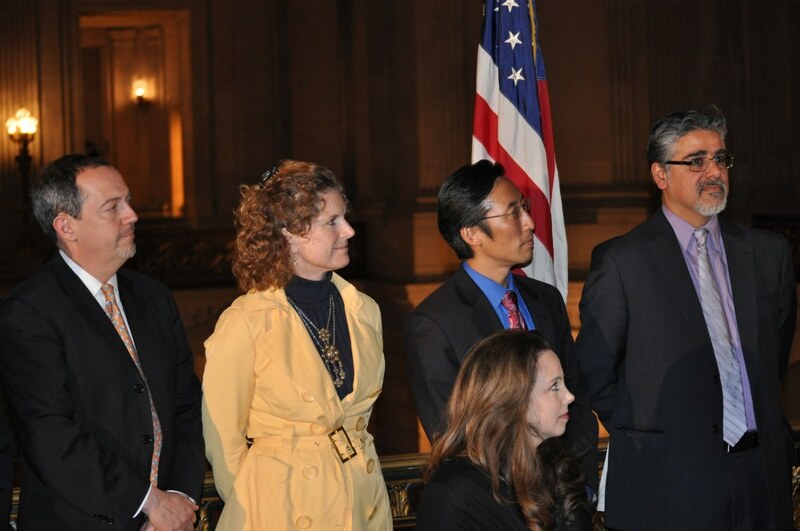 Behind them L-R, are Supervisor John Avalos, Board President David Chiu, City Attorney Dennis Herrera, Supervisor Sophie Maxwell (a supporter over the long haul), and Supervisor Ross Mirkarimi, who grew up with Cup racing in Rhode Island and spearheaded the proposal within the Board . . .
And I hope it’s windeee. Hey, this is San Francisco. So, in a city with notoriously fractious politics, we have united a divided Board of Supervisors with an Office of the Mayor they’ve sometimes treated as the enemy. We’ve brought the leading environmental groups to the table eagerly offering to help speed environmental reviews. We’ve secured the support of maritime unions who were queasy at first about foreign crews working foreign-flagged vessels in US waters. We have proved that it is possible to cut a deal inside the glass house of democracywith a few sausage cuttings smearing the windowsand the man driving the next move is the man whose ambition and determination won the America’s Cup in February, 2010 in a boat with a wing sail too tall to fit under the Golden Gate Bridge. To drive that next move, he has a new wheel. Here is Larry Ellison accepting the season trophy for RC44 racing in Europe and, now, the USA. 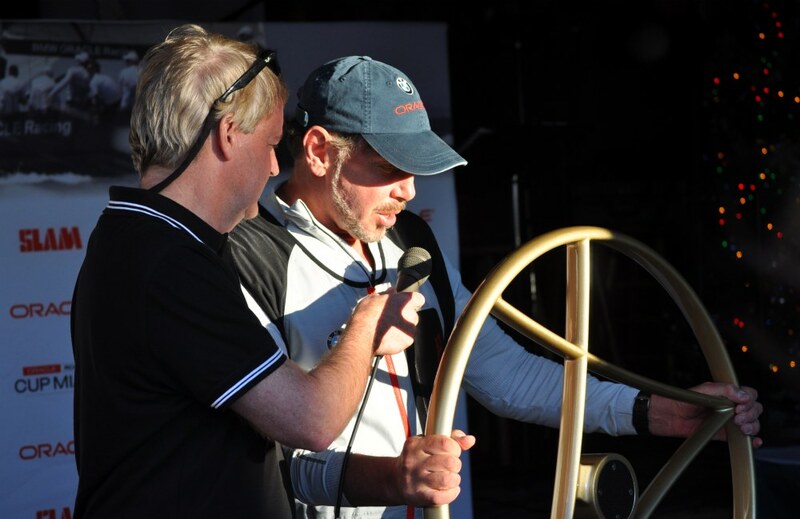 The trophy is a gold (colored; he can always upgrade that) wheel for his 44-foot sloop of the RC44 class, a one design created by four-time Cup winner and BMW Oracle Racing CEO and, also, tactician on the boat, Russell Coutts. Ellison wrapped up the win last weekend in Miami, as he was preparing to dispatch representatives to reopen host city talks with Newport, Rhode Island, home to Cup racing until Australia’s wing-keeled wonder loosed the famous trophy to the world in 1983. We’ve gone from wing keels to wing sails. Jawboned or not, it’s great to be alive . . .
Oh, the betting line: The last time I checked, Northern California was still the leader in information technology, which appears to be a viable industry going forward, and which, the last time I checked, appeared to be a viable sponsorship pool. Long-term readers will know that I thoroughly enjoyed my time in Valencia, Spain and rose to defend it against detractors. But VLC is just not part of this equation. Newport, RI was and is and shall remain a fine, international sailors’ town, with a great draw. I love Newport. But it doesn’t have the wind, the amphitheater, the backgrounds of San Francisco Bay.